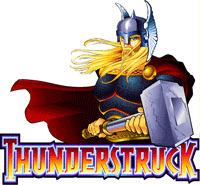 “Thunderstruck” is a Microgaming online slot that is set in medieval times. There is a standard version of the game and a successor, Thunderstruck 2. 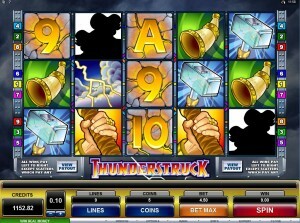 In general, Thunderstruck is a fast-paced slot with great action during the bonus rounds. Click here to play Thunderstruck now, or keep reading to find out more. Thunderstruck revolves around a medieval castle and a powerful thunderstorm. Among the symbols on the reels are rams, medieval tools and weapons, and the Thor symbol. The images and animations are rather basic, but sometimes when you score a winning combination, the symbols are animated. For instance, Thor’s beard starts blowing in the wind. Thunderstruck has 5 reels and includes both a wild symbol and a scatter symbol. The “wild card” is the Thor symbol. Whenever it is part of a winning payline, it doubles the player’s winnings. It also replaces all other symbols, except the rams. The rams are the scatter in this slot. Whenever it shows up 3 or more times, the bonus round is activated. There are 9 paylines in total, the amount of which can be varied freely. You may also set your desired bet amount per each line. You can also select various autoplay options, for instance spinning 5x or 10x with just one click. Thunderstruck has an exciting bonus round feature. It is triggered when 3 or more rams appear on the reels. 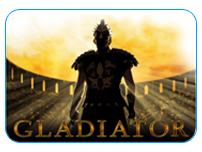 The player then gets 15 free spins, during which all winnings are multiplied by 3! It is also possible to win even more free spins during this bonus round. Thunderstruck also comes with an interesting gamble feature. Not only can you double your winnings by predicting the right color of the next card, but you can also quadruple them if you also predict the right suit! Keep in mind that there is a limit of 5 gambles per game. There is no jackpot for this online slot. The return to player percentage is given as around 96%. You will get the highest winnings if the Thor symbol comes up 5 times. 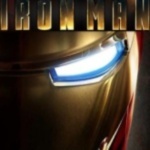 This will give you 10,000 times your initial bet!